It was a quite task trying to pull myself away from Rêveur's Moist & Gloss Shampoo and Treatment, but when L'Oreal Paris sent me tubes of their latest sulfate-free hair care products, my curiosity was piqued. For the uninitiated, sulfates are found in many hair care products. They are the forming agents that create suds... Which make washing ourmy hair so much fun (Yes, I am old and I love my foam.). 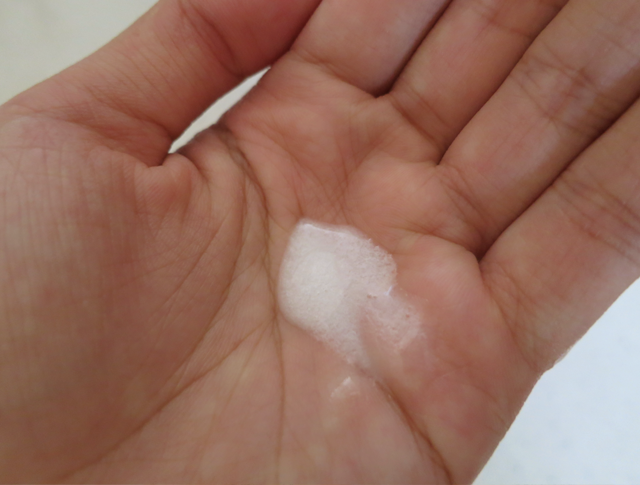 However, despite their pristine white and innocent appearance, they are actually very harsh chemical detergents. 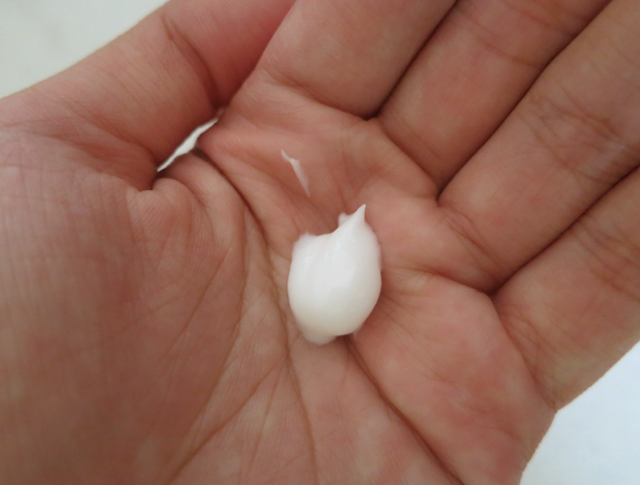 Sulfates have the potential of aggravating our scalps and destroying healthy hair. They stripped our hair of everything, both the bad AND the good. Our hair fibers lose their natural oils, weaken and eventually break. Under their reign, sensitive scalps may find themselves flaking and drying out. 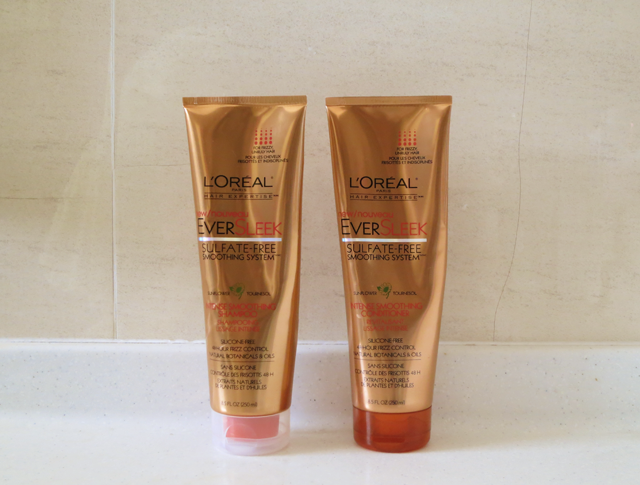 Eeps, it sounds pretty terrifying but then, we have L'Oreal Paris's EverSleek Sulfate-free Smoothing System to save the day! This hair care system, made for frizzy and damaged hair, is free from the clutches of evil sulfates and heavy silicones. It is formulated with Argan, Sunflower and Olive oils. Instead of coating our hair with suffocating silicones, these natural oils penetrate our hair fibers to smooth them for a 48-hour frizz control. The shampoo and the conditioner come in 250ml tubes, with transparent and orange-coloured caps respectively. Both take the form of a white cream, with the former having a satin-like finish. During my first week of trial, I alternated the above with my Rêveur's, which are only silicone-free, and there were very obvious differences. For starters, the shampoo didn't form as much due to the absence of sulfates. And after washing and conditioning, I felt that my hair wasn't as moisturized but it had more volume and body. In the second week, I used only the EverSleek Sulfate-free Smoothing System and my hair pretty much felt the same, i.e. more volume and body but unfortunately, not so moisturized. It's probably because I had dyed and bleached my hair previously. L'Oreal Paris actually has an EverPure Color Care System (Which they also sent over. Thank you sooo much! ), so that range may be more appropriate for me. As for the 48-hour frizz control, I felt that it didn't really happen. But then again, Singapore's weather is pretty impossible. My hair is also of the much coarser type so the system just wasn't strong enough to battle with my lion's mane. 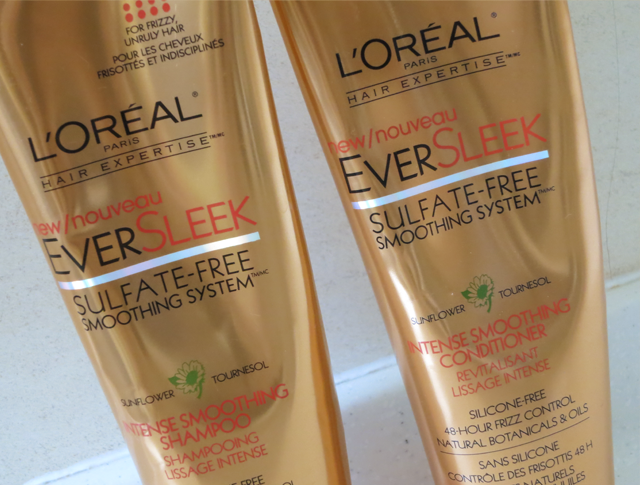 In spite of its shortcomings, I really appreciate the fact that L'Oreal Paris' EverSleek Sulfate-free Smoothing System Intense Smoothing Shampoo and Conditioner come sulfate-free. I was having a chat with a lady the other day and she asked if I noticed how many of us are losing hair at an increasingly young age. She reasoned that it was because we use way too many products containing sulfates. I'm sure stress, environment and many other factors come into play as well. But knowing that I have taken care of one major factor (That is, eradicating sulfates from my products.) makes me less worried. Anyway, besides the EverSleek Sulfate-free Smoothing System, there are 3 other systems for you to choose from; EverPure Color Care System for coloured hair, EverStrong Fortify System to reduce hair loss and EverCrème Moisture System for intense moisture. They can be found in supermarkets, pharmacies and departmental stores island-wide, with prices ranging from $14.90 to $21.90.